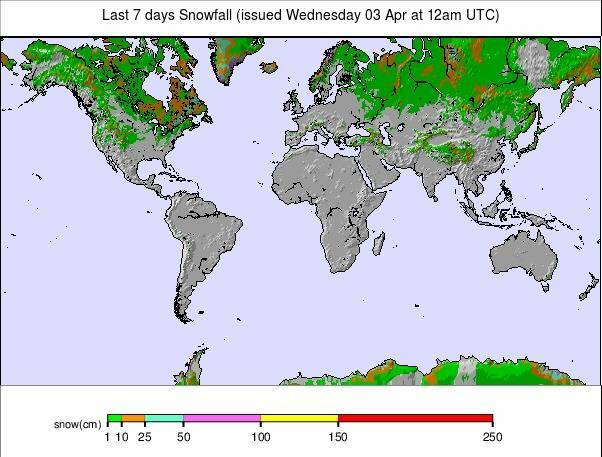 Our latest roundup of snow conditions around the world. Each section that follows below goes into detail country by country. Clicking the map thumbnail will take you to our dynamic snow forecast map for the latest detail (where you can also overlay live weather & reported conditions). Weather outlooks for Europe and North America can be found at the end of this roundup. It’s been snowing across Australia with just over two months to the start of the 2019 ski season. Here’s Hotham Alpine Resort. After the snowy weather in the eastern Alps a little over a week ago now, the weather has settled down in much of mainland Europe. Conditions have returned, for the time being, to classic sunny spring days with the resulting hard-packed snow freezing solid overnight then slowly softening through the day, particularly on lower slopes. Those conditions have been changing in the past 24 hours though with much more changeable conditions moving in; heralding a return of winter. Heavy snowfall is forecast for Wednesday through to Friday this week in much of the Alps as well as down in the Dolomites. Some very big accumulations are possible and almost everywhere should see some fresh snow. Avalanche danger levels have been down at their lowest level (1) in the mornings, rising to 2 (moderate) as things warm up. However, the heaviest snowfalls from Wednesday have the avalanche danger agencies warning the risk could easily shoot up to level 4, one below maximum, by the end of the week. Elsewhere, the Dolomites have reported similar weather to the Alps (but are also now seeing a change). Whereas, the Pyrenees have been seeing snowfall since the weekend and that light to moderate snow with wintery conditions is ongoing through this week. Up in Scotland, ski areas had been losing the battle to keep slopes open but it is now getting a little more wintery too, which is good news for Glencoe; the resort that’s still got some runs open to enjoy the new snow at. Across the North Sea, there’s been 15-30cm of fresh snow in western Norway and up in northern Sweden too. Across the Atlantic in Canada and the US there has been more in the way of fresh snow than there has been in the Alps with Utah, in the US, reporting the biggest snowfalls on the North American continent of the past week. Some resorts there received as much as 90cm (3ft) of snow over the weekend. Other areas got much less snow on the whole, but most still got some. 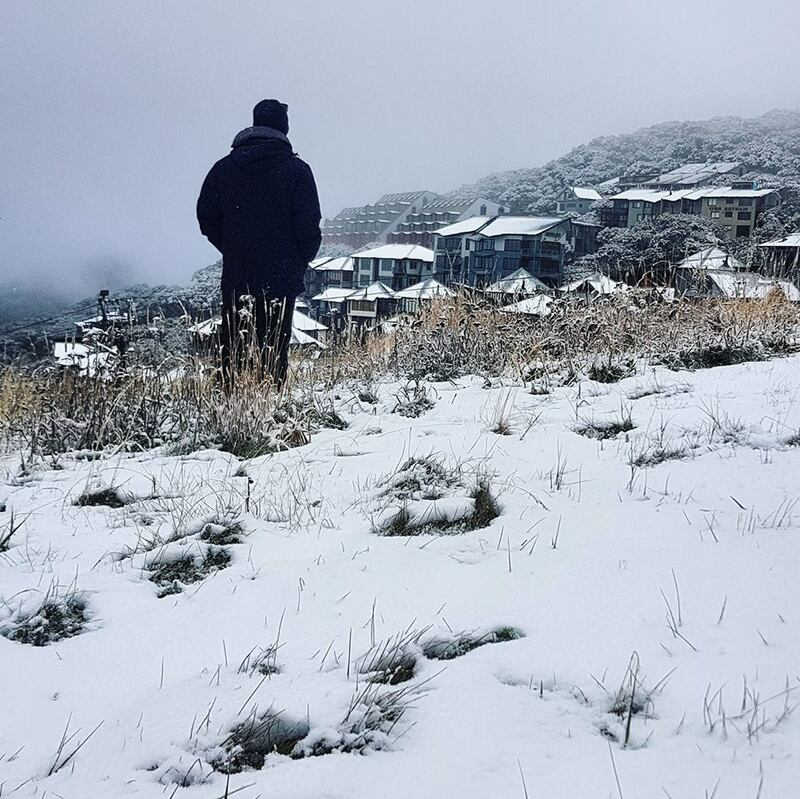 Meanwhile, south of the equator, there were some exciting early signs of the changing season ahead of the 2019 season (two months away) with snowfall across Australian ski slopes over the weekend. It has mostly thawed away since but it certainly got the country’s skiers excited. 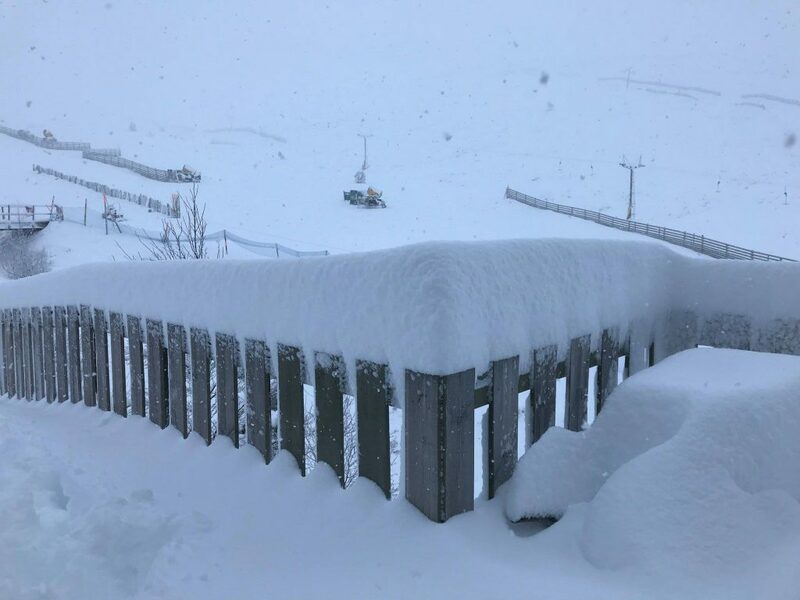 Snowy images from Afriski ski area in Lesotho, Southern Africa on Monday morning did the same there until they realised it was an April’s Fool. It’s more and more spring-like in the skiing world of the northern hemisphere (well, it is spring after all), with plenty of sunshine to be had and thawing temperatures on lower slopes. Perhaps 10% of Austria’s smaller, lower level ski areas called it a day on the 2018-19 ski season on Sunday. But, for most, there’s still several weekends (or more) of the season left and after the huge January snowfalls in the west of the country many are still sitting on deep bases. Indeed, despite a mostly dry and sunny week, about a dozen Austrian areas still have snow lying at least 3.9m (13ft) deep on upper slopes including St Anton (20/390cm), Altausee (45/400cm) and six of the country’s glacier ski areas, most of which stay open to May or June. There’s fresh snow on the way for much of the country towards the end of the week too. France had pretty much wall-to-wall sunshine like most of the rest of the Alps through the past week. Base depths have continued to decline, just a little, as a result with only Les Arcs (148/310cm) still posting a 3m/10ft plus base depth. That should change this week though with some significant snowfall expected as the sunshine comes to an end for a while through the latter half of this week. Up to then though it’s likely to be more hard packed slopes; hard and icy in the mornings, softening fast in the afternoons. Unlike Austria, most French ski areas are still open and will remain so through to Easter or at least the weekend before: April 14th. A dry, sunny week too for Switzerland on the whole where Engelberg (15/636cm) and Andermatt (25/600cm) are still posting the world’s deepest snow bases and look set to see them increase if the big snowfalls expected for the end of this week across the country live up to expectations. In Switzerland, too, conditions are now changing to much a more unsettled situation and, from Wednesday, very snowy weather. Most of the country’s ski areas are still open with all of their terrain skiable from top to bottom too but a few, mostly smaller resorts have closed already. The surprise perhaps is that Gstaad (10/170cm) decided to call it a day on the season on the last day of March. After a mostly sunny week in Italy the weather has also been changing here in the past 24 hours. Some huge snowfalls are forecast right across the country for the latter half of this week. Here too almost all of the country’s ski areas are still open. Just a few small centres have opted to close midweek and open for the next few weekends. Passo Tonale (400/400cm), its nearby glacier slopes normally open to May or June, still has the country’s deepest published snow base but if the big number snowfalls arrive as expected that could change by this time next week. As it is, most of the country’s other leading ski areas still have healthy bases from top to bottom and everything open with spring skiing conditions. The start of April is a snowy one in Andorra and the wider Pyrenees with lots of snow falling since the weekend and expected to continue through the week ahead. Unlike the very heavy snow expected in the Alps later this week the accumulations should be more modest and spread throughout the coming week, not concentrated in just a few days. Currently, conditions are fairly good with all runs open, only the snowfall and associated low cloud are causing limited visibility at times. The Arcalis area (135/200cm) has the deepest snow in Andorra; Grandvalira (50/110cm), the biggest area, has the most runs open. As has been the case for much of this winter, whilst it has been dry and sunny in the Alps, the snow has kept falling in Scandinavia to the north. 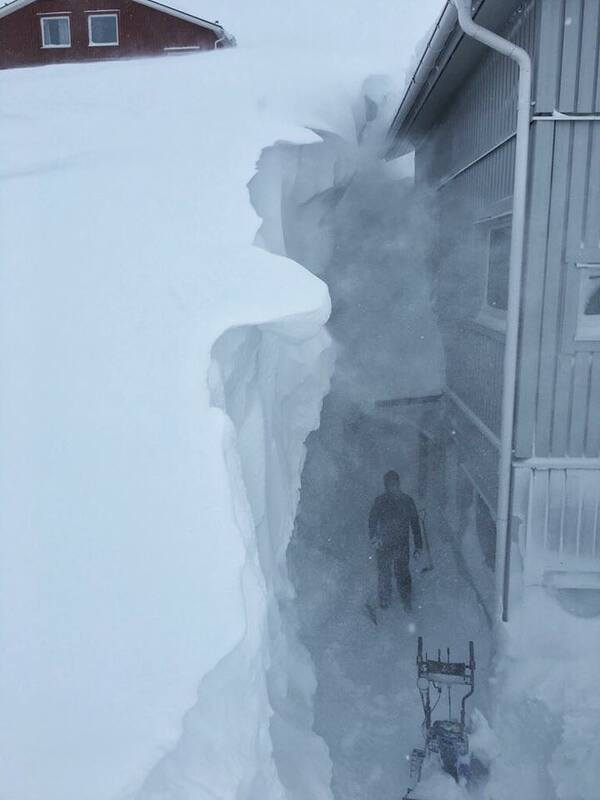 This past week has been no exception with some of the biggest accumulations in the far north up at Riksgransen (400/400cm), in the Swedish Arctic, which now reports the deepest snow in the region and is looking better than last year to make it through to its targeted mid-summer (late June). Plenty of fresh snow in western Norway too with Stranda (150/150cm) reporting 25cm of new snow in the past few days; Voss (50/150cm) and Roldal (130/140cm) reporting 15cm each in the same period. More than 90% of German ski areas have actually closed for the season as many are relatively small, at relatively low altitude and there’s a tradition for them to close by the end of March in many cases, even when there’s plenty of snow. However, most of the country’s dozen or so larger destination areas remain open with the highest: the Zugspitze (0/430cm) due to stay open to the start of May. No real fresh snow in the country in the past week but that’s due to change with some large snowfalls forecast over the next 72 hours. Bulgaria’s ski season is winding down with the temperatures climbing higher above zero and bases thawing fast. Most of the country’s resorts are scheduled to close at the end of this coming Sunday 7th April, although Bansko (5/180cm) which now has the deepest upper slope base in the country is planning to stay open another fortnight to Easter weekend. For those that are closing this weekend, it looks like potentially a fairly snowy end to the season, with snow flurries forecast into the weekend, the heaviest most likely at Bansko. Up to 40cm of fresh snow reported overnight in Scotland. Will ski areas be able to re-open? Of course Glencoe, The Lecht and Nevis Range still have some terrain open anyway. Here’s Cairngorm on Wednesday, 3rd. Unfortunately, conditions have continued to deteriorate in Scotland with not only Glencoe (0/30cm) having more than just small beginner areas open. Despite overnight freezes and some fresh snow there are only a few runs open there too now, with skiers and boarders having to negotiate patchy cover to make descents. The Lecht (0/10cm) has snow-factory made beginner snow runs, Cairngorm (0/0cm) are having technical problems with their machine so are currently closed. 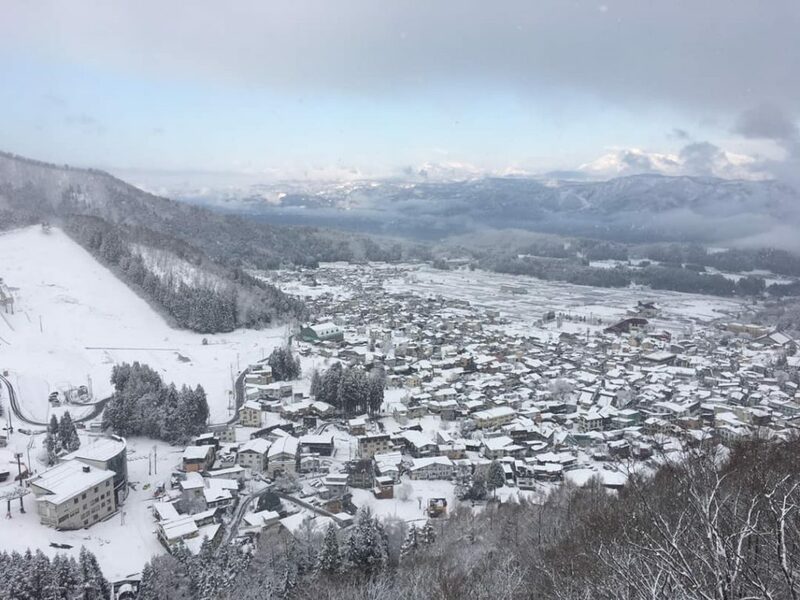 After a fairly dry March at most areas, several Japanese resorts have reported a snowy start to April, with up to 30cm of fresh snow in the last 24 hours; as much as some got all last month. Here’s Nozawa Onsen on Monday, 1st. A mixed picture in Japan. It was a mostly fairly dry March for many of the country’s ski areas but a few have had fresh snow; that’s got heavier in recent days. Zao (70/180cm) is the stand-out resort posting 60cm in the past week, including almost 30cm (1ft) on April 1st; really transforming conditions there from old brown snow to fresh powder. Niseko (95/325cm) is, unfortunately, continuing the dry trend which saw it receive less than 50cm of fresh snowfall through the past five weeks (although the area had 9 metres of snow in the first four months of the season). Not a particularly snowy week for much of the US. The biggest reported falls came in the Rockies around the weekend when Alta (399/399cm) and Snowbird (399/399cm) each clocked up around 90cm of fresh snowfall in 72 hours. They’ve had a few inches more since then too. Elsewhere, some ski areas in California and Colorado posted 15-25cm accumulations in the past few days too. But, for most, it’s just an inch here or there. Perhaps 10% of US ski areas closed for the season over the past few weekends. They’re widely spread from east to west coasts but tend to be smaller, local areas so far with most of the big names open for at least a week or two more (and some to May, June or July). Most of Canada’s ski centres are still open; only the majority of ski areas in Ontario have now called it a day with temperatures there described as a ‘roller-coaster’ between well into double figures and a real thaw. More recently, there has been a return to sub-zero temperatures and fresh snowfall. Blue Mountain (100/100cm) reported one of the biggest snowfalls of the past few days: 20cm. It has also been snowing in northern Quebec and out west in Alberta and BC, helping to provide fresh cover at many areas as we enter April. Tremblant’s (572/572cm) base remains the country’s deepest. The week ahead across most of Europe’s ski areas is looking the snowiest for some time with heavy snow forecast in the Alps and Dolomites. Plenty of snowfall too for other regions including the Pyrenees, Scandinavia and Scotland. The snow has already started falling in some areas and for most will be heaviest on Thursday when some resorts are expected to receive more than 60cm (2ft) of snow on their higher slopes. The snow will also be heavy on Wednesday and Friday, in some areas, meaning total new snowfalls by the weekend could potentially be more than a metre, in some cases. Although, for most, the numbers will be more like 20 – 50cm. The snowfall level will be approximately 1500m in the Southern Alps but will drop to lower altitudes elsewhere. For Austria, the heaviest snow looks to be falling on Thursday and Friday in most areas with 30-40cm of snowfall in the forecast. But for some resorts, the totals may be much bigger with the western Otztal region as well as the Stubai potentially seeing up to 90cm (3ft) of snowfall, for example. In France, Wednesday and Thursday look like being the snowiest days of the week with many resorts forecast to get 20-50cm of fresh snowfall right across the French Alps. Switzerland is also due to see some big snowfalls between Wednesday and Friday. The Italian Alps, in the north-west and centre of the country, as well as the Dolomites in the northeast, are set to see some of the biggest snowfalls of all. Accumulations of 40-80cm are forecast for the Italian Alps, mostly falling on Wednesday and Thursday. But in the Dolomites, the snow should continue through three days and could add up to as much as a metre for some including Arabba, Madesimo and the Fassa Valley. If that proves correct it would be the biggest fall of the season. In the Pyrenees, the snow that has already been falling since the weekend should continue, on and off, through to next weekend making week-long totals of up to 60cm (2ft) possible. For Scotland, there are more snow showers forecast but most of the centres may need more than is likely to fall in order to be able to reopen. However, that remains to be seen. Scandinavia will continue to see fresh snow falling too. 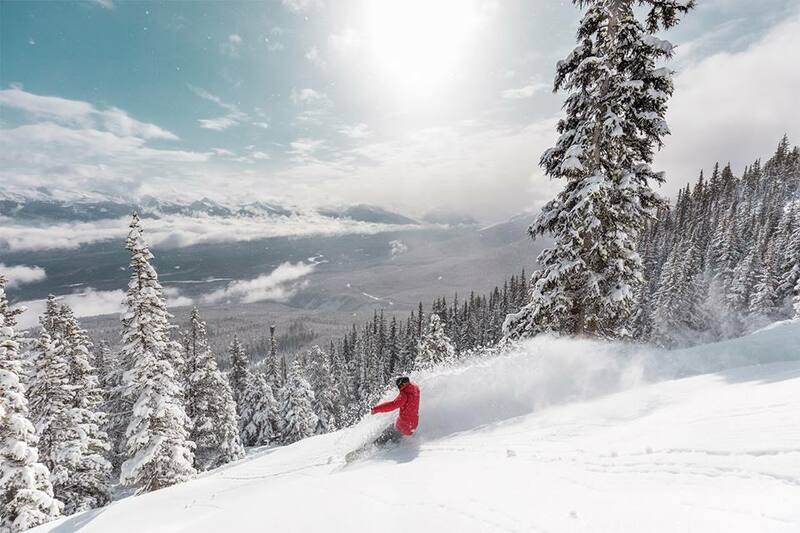 Marmot Basin (in Alberta, Canada) normally stays open in to May and the 28cm of fresh snow just received should help with that this year. It’s looking much quieter in North America than in Europe when it comes to snowfall over the coming week. There is some snow in the forecast but, in most places, it will just be a light shower here and there not adding up to more than 10cm (4 inches) over the coming week. The exception is the Pacific Northwest with Whistler in line for more than a metre of snow up on the BC coast of western Canada. The biggest snowfalls are expected in the west with up to 20cm of fresh snow possible in Colorado, Utah and Montana and up to 40cm in California and perhaps 50cm at resorts inland from the coast up in Alberta and BC, in Canada.